The circuit converts an off-the-shelf solar powered LED path light from producing a steady state light to one that produces a flash. This circuit includes a tiny dual Schmitt trigger inverter IC which form the pulse generator and the daylight sensor circuit. 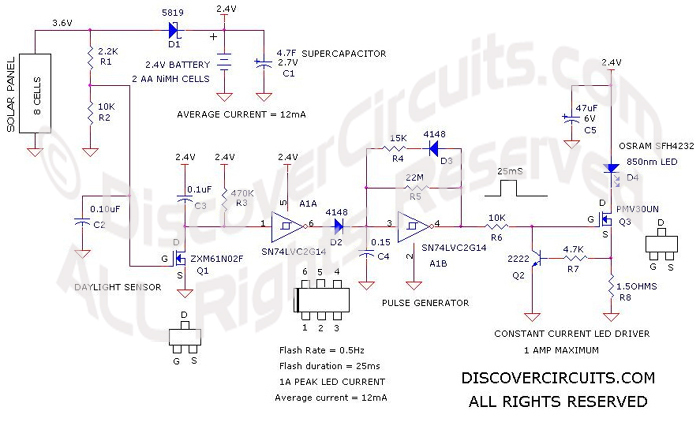 The circuit produces a positive pulse, which feeds the constant current LED driver circuit. With each pulse, a heavy 1 Amp current pulse is sent through the infrared LED. A second Schmitt trigger was used in the day/night sensor. The voltage produced by the solar panel when illuminated by sunlight was used to suppress the pulser oscillator during daylight. The LED driver circuit uses a quality n-channel MOSFET with a low channel resistance and a simple current regulator. The regulator relies the voltage developed across a resistor. When the voltage reaches about 0.6v it is enough to turn on a NPN transistor. When turned on, the transistor reduces the drive voltage on the MOSFET gate. This negative feedback keeps the current set close to 1 Amp. To aid in maintaining current regulation, by keeping the battery voltage from plunging, the circuits has a 4.7 farad supercapacitor across the battery.